Esteban Cabeza de Baca’s studio in Harlem has two windows. One of them faces 125th street and looks out on a building under construction. The other opens onto Texan mountain scenery. It was painted by Cabeza de Baca on a 6 x 6-foot canvas. “I wanted to see that landscape, but I am deprived of it because I am in the city,” he explains. Born in San Ysidro, California, the painter arrived in New York in 2007. Now, at 28 years old, he is in his second and last year of the Master of Fine Arts program in Visual Arts at Columbia University. 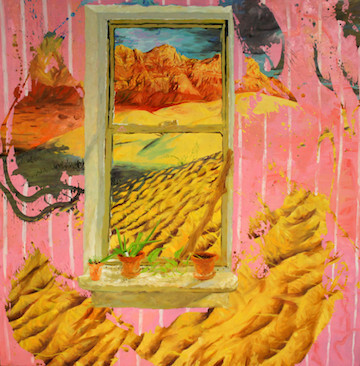 The jagged landscape with sunset colors can be seen both inside and outside the window frame in “Lose My Heart in the Burning Sand,” a painting that displays Cabeza de Baca’s experimental practice as an artist. To make this abstract work, he first painted the mountains, the sand, and the window. Then, Cabeza de Baca spilled some masking fluid onto the canvas, which created a transparent latex layer that he would rip off later. Before he did so, he covered the area around the window with pink paint. When Cabeza de Baca removed the masking fluid, parts of the scenery were revealed, making it seem as if the landscape was seeping from outside through the pink wall. More than showing off his skill, the work represents some of the themes that preoccupy him. “It is based out of my Native American line of painting,” he says. In a series of works produced last year, Cabeza de Baca chronicled the lives of indigenous people in the United States. He painted rituals and tribal scenes. His attraction to the subject is personal: his mother’s family has Apache and Navajo heritage. The pink wall also has an important meaning. Cabeza de Baca was raised in a house right at the border between the U.S. and Mexico. “I grew up seeing walls all the time,” he says. His family’s stories about traveling freely between San Ysidro and Tijuana deeply influenced his imagination and eventually worked their way into his repertoire as a painter. “I remember my mom telling me stories about when she was able to, as a five-year-old, just to walk down across the border and get a tortilla. I never experienced those really pretty times, or at least more relaxed times,” says the painter. “It was a Latino household,” his mother, Rosario Cabeza de Baca, remembers about the period that they lived in San Ysidro until the beginning of the 1990s. Her family came from Mexico to the U.S. during the 1950s. When Cabeza de Baca was a child, he lived for two years with his parents and four siblings at his grandmother’s home in the city. His great-grandmother, an uncle, and an aunt also lived in the two-story house. Cabeza de Baca did not start talking until he was five years old. “The speech pathologist said to my parents that I didn’t have anything to say,” he explains. He was not diagnosed with any kind of learning disabilities, and it seemed that it was his choice not to speak in full sentences. According to his mother, he was just busy doing other things. “His world was in textures and colors,” recalls Rosario Cabeza de Baca. She realized that painting was important to him when he was still a toddler. Whenever the family was in a car, he would stay quietly in his seat only if he had something to draw on. “It was sort of a compromise. I would just give him paper, pencils, pens, whatever,” she says. She would do anything to prevent him from unlatching himself from the seat. By then, the mid-1990s, the family was living in Denver, Colorado. In 1993, Cabeza de Baca’s father, Vincent, took a job there as a History professor at a community college. It was in this city that young Esteban was formally introduced to an artistic education. He was 11 years old when he was accepted into a brand new program at the Denver School of the Arts. “I see him a lot in my mind as that bright, fresh, young soul, walking in the front door, in a nicely pressed outfit, with his portfolio ready for his audition,” says his former art teacher Darrell Tomlinson. In the school, Cabeza de Baca was introduced to ceramics, bronzing, and many other art forms. Painting, however, remained his passion. And Tomlinson, providing him the training that he lacked, also became the young artist’s mentor. Cabeza de Baca remembers how “he taught us to work from life.” Creating a work through real-life observation became an important part of his learning process and years later he would return to this method of painting. Water flowed over his feet while Cabeza de Baca arranged the easel. It was summertime, and the painter had driven up to Monticello, upstate New York. 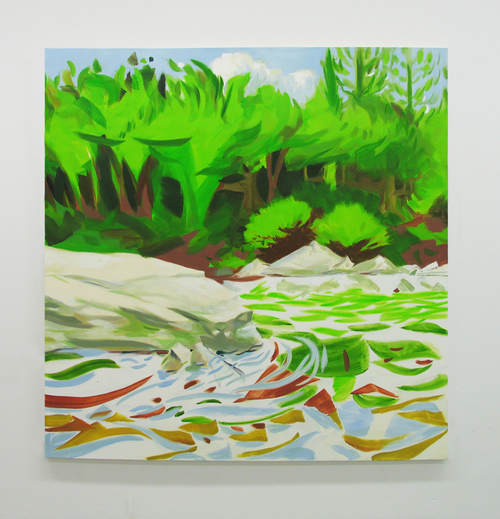 For the first time, he was painting a river from direct observation. “It had always been from photos before,” he admits. It took him around 45 minutes to complete the painting, one of several works on 12 x 12-inch Masonite boards that he created last summer. Cabeza de Baca depicted the river from a point where it makes a turn around rocks. Bright green trees form the background. He preferred not to interact with other people while working, and that included his girlfriend, her parents, and some friends who accompanied him on the trip. “We discuss the paintings after they are finished,” explains Heidi Howard, his girlfriend, who is also a painter. 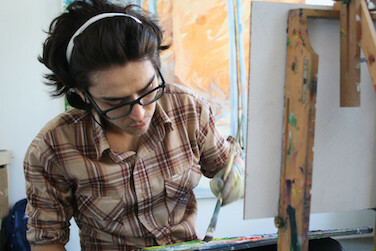 Cabeza de Baca now describes himself as “an observational painter by heart.” Influenced by a fellow MFA student, he started going outside of his studio to get inspiration. He carries his material in a small backpack: oil paints, two brushes, a palette, an easel, and a canteen with turpentine, a solvent used for thinning the paints. Cabeza de Baca also usually brings a portable bench. “It’s good to sit, so you don’t have to think about moving. You can just have all your physical thought directed straight to making a piece of art,” he explains. Cabeza de Baca makes larger versions of paintings when he feels satisfied with what he brings from outdoors. He is now using square-shaped canvases, so that he does not have to decide whether the painting will be a landscape or a portrait: “It’s balanced and equal. It can be both.” His most recent works differ technically from what he produced at the beginning of the year and in 2012. Thick marks of paint were more present in his previous paintings. “He opened up to light and air, and to a lighter touch, and I think that is making the painting much more exciting,” says Amenoff. Either way, he takes brush to hand. “He likes to work 12 hours a day, regardless of the schedule,” his girlfriend says. “And he hardly ever takes the day off.” This is a characteristic present in his life since childhood. “He always stays busy. The time that he gets lazy he is just lying down because he collapsed,” Rosario Cabeza de Baca explains. This intense way of working contrasts with his calm demeanor. He talks slowly, as if carefully choosing the appropriate words for each sentence. As his MFA final project, Cabeza de Baca is planning to go back to San Ysidro to do a series of observational paintings. It has been around seven years since he last went to his birth town, where his grandmother still lives. He is interested in producing works related to immigration issues. “I got nurtured from this weird political, social and economic situation of living along the border,” he says, and he wants to visit that place of intersection. It will be an opportunity for him to combine his observational techniques with his interest in social issues.